I recently bought two moisturizer just to try it out since winter have already knocked the doors and even if you have oily or combination skin dabbing on some light in texture moisturizer can be really beneficial and should be included in the skin care routine. 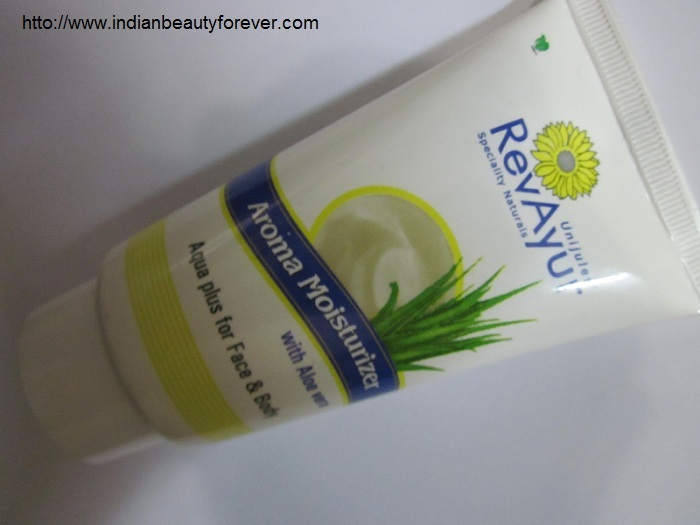 Today, I will be reviewing Revayur Aroma plus Moisturizer for face and body. Company says- Fine textured formula that absorbs into the skin. It locks moisture within skin for deep hydration. Helps skin to maintain optimal / optimum moisture levels. 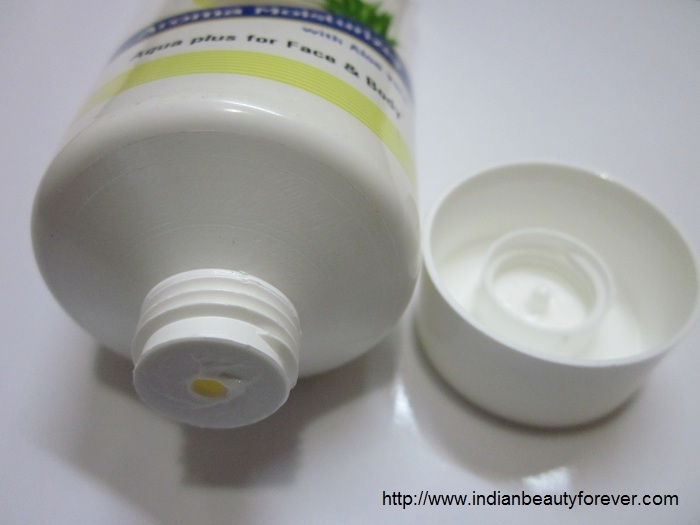 Light Aloe formula gives soft and comfortable feel to skin. 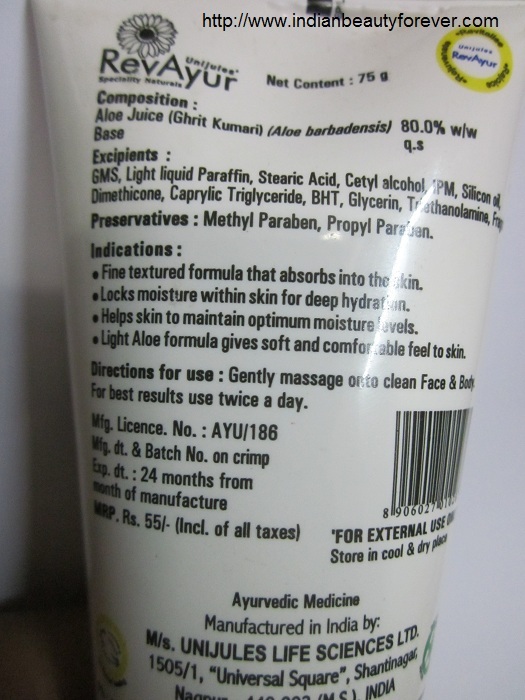 How to use - Gentle massage onto Clean Face, Body, Hands or other affected area. For best results use twice a day. My Experience- I bought it just for the purpose of trying it out and if it does not suit me I thought it can be a hand lotion since it says that it is a body moisturizer too. I have used it only twice on the face since I do not like to try two different products at one time and I am quite satisfied with the Clean and Clear oil free moisturizer. However, it has a nice texture that gets absorb easily into the skin. I have used their lip balms and one of the Anti blemish face pack which were decent products and that is the reason that I thought of trying it. They have mentioned in the list of ingredients that it has aloe Vera. I like products with aloe Vera some how they suit my skin. It hydrates the skin and stays there for 3-4 hours since it is very light. Available online, cannot say about offline availability though. Texture is light hence it gets absorbed easily. Packaging is travel friendly and hygienic to use. It has very mild fragrance, nothing over powering or too strong to give headache. May not suit very dry skin. Hydration is not long lasting. My Take- Overall, it is a good product but still I will not recommend it for the face but of course it has proved to be a good light moisturizer for the body but might not be able to cure very dry skin. I have oily skin but in winters it still requires hydration.